Julianne Moore plays a soprano hired to perform at a private dinner party in South America for a wealthy Japanese industrialist played by Ken Watanabe. When guerrilla rebels storm the social gathering, they take the guests hostage and then the unexpected happens as Weitz contravenes stereotypes, turning the thriller into a poignant drama. The term “bel canto” is Italian for “beautiful singing,” which aptly describes the voice of Roxane Coss (Moore), an American opera singer who travels to an unnamed South American country to perform at a diplomatic dinner hosted by Vice President Ruben Iglesias (Eddie Martinez). The guest of honor is Japanese industrialist Katsumi Hosokawa (Watanabe) an opera enthusiast and Coss fan who is being wooed by the impoverished nation to build a new factory with the hope of boosting the economy. Since Hosokawa can’t speak Spanish, he has brought along his young assistant and translator Gen (Ryo Kase), who is fluent in several languages. As the evening commences, Coss makes a grand entrance, immediately enchanting the crowd, especially Hosokawa, but just as the gifted singer begins to perform, armed rebels storm the mansion in search of the president. When they discover he’s not at the function, the group’s leader Comandante Benjamin (Tenoch Huerta) orders the young rebels to take the party guests hostage, leading to a lengthy standoff. 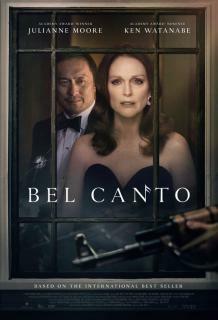 Based on the acclaimed novel by Ann Patchett with Weitz and Anthony Weintraub handling the screenplay, “Bel Canto” morphs from an action thriller into a beautiful love story as Hosokawa and Coss begin to develop a romance. Despite the unusual casting choice, Moore shines as the gifted soprano, although I wasn’t fully convinced she was actually singing (American opera singer Renée Fleming handles the vocals). In certain scenes, it’s obvious she’s lip syncing. It’s a minor flaw that can be easily overlooked thanks to the real chemistry between Moore and Watanabe. Romance also blossoms between Gen and a young female rebel named Carmen (María Mercedes Coroy) who asks the translator to teach her how to read and write in both Spanish and English. Coroy is a superb actress who played the lead in the arranged marriage Guatemalan film “Ixcanul” in 2015. Her compassionate performance is mirrored by Mexican actor Tenoch Huerta as the Comandante whose passion for his cause, his troops and the South American people exposes the leader’s inner humanitarian. The film does a magnificent job of making these characters three-dimensional. Huerta brought a similar twist to his character Lil’ Mago, the intimidating leader of the Mara Salvatrucha gang, in the 2009 film “Sin Nombre” by director Cary Fukunaga, who just took over the latest Bond film after Danny Boyle’s exit over creative differences. The rest of this fine cast includes Christopher Lambert (“Highlander”) as French Ambassador Simon Thibault, who plays the piano and cooks for the hostages, and Sebastian Koch as a Red Cross negotiator who is the only one allowed in and out of the captive home. It’s a mostly male-driven cast since the women and children are released early on. Only Coss is forced to stay behind as a bargaining chip for the rebels. Like an actual opera, “Bel Canto” features some very beautiful moments and of course plenty of tragedy. Moore and Watanabe breathe life into Patchett’s characters, their performances backed up by a first-rate cast.